Imagine if you could have a car backup camera mounted right by the license plate. Your view of what is behind your vehicle would be far superior to using just your rearview mirror. Even better, the camera could warn you with an audible signal before you hit anything. Wouldn’t that make you feel safer? We are excited about this new technology of reverse cameras that make parking and backing up so much easier than before. Not only does it prevent damage to your car, it saves lives. Countless children would be alive today if vehicles were all equipped with backup cameras. Let’s take a look at two aftermarket backup cameras that you can install on your car. The first one is completely wireless and extremely easy to install. Pearl’s RearVision Wireless Car Backup Camera is the ideal, easy-to-install solution for someone who wants to see what’s behind their car, truck, or SUV. It’s completely wireless because it uses Bluetooth to communicate with your smartphone. Your smartphone is the display screen for the camera. The camera, or should we say, dual cameras, are embedded in a frame that holds any American license plate. 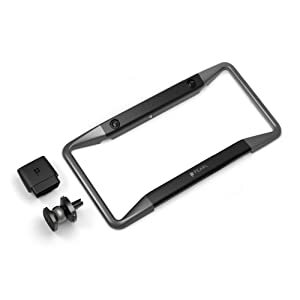 Unscrew your current license plate holder and replace it with the Pearl RearVision camera frame. The frame blends right in so you can’t even tell it’s there. It just looks like a plain license plate holder. 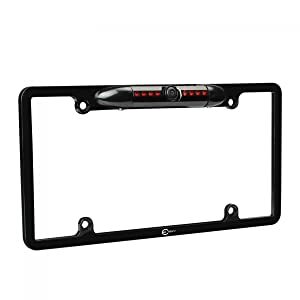 The cameras embedded in the plate holder are weatherproof and resistant to theft because their frame locks into place. Even better, the cameras are solar-powered so you’re not wasting your car’s battery to run them. You’ll see a great deal of all that’s behind you because you can switch between normal and wide-angle views. You can even peek around a corner by pivoting the cameras 140-degrees left or right. If you’re driving at night, there’s no problem. The RearVision camera emits infrared so you can see in high definition clarity in the dark. Now install the car adapter inside your car in the OBD port. Pearl gives good instructions for how to do this depending on your vehicle. You can read them, or watch an instructional video. Install the phone mount on your dashboard so you have a convenient view of your screen. The magnetic phone mount makes it super easy to place and remove your phone in a hurry. Install the app on your smartphone. Then link your phone to the cameras with Bluetooth. As long as you have your Bluetooth turned on, the phone and the camera will automatically communicate as soon as you enter the car. The RearVision will beep to alert you if you are approaching an obstacle. This is very helpful indeed if you need to back into a tight parking spot. Pearl says their Bluetooth backup camera works on every car, truck, or SUV. There are a few car models that might need a little adjustment for the license plate holder camera to fit. If you have a Audi, VW Jetta, Volvo, or Jeep Wrangler, please double-check your license plate style before you purchase the camera. The Pearl RearVision wireless backup camera is covered by a 3-year warranty. Not everyone wants to use their smartphone screen as a display. If that describes you, check out this Rear View Camera from Esky. Like the Pearl RearVision, the camera is embedded in a license plate holder. It should fit most vehicles and is easy to install. The camera is waterproof against rain and splashes, plus it has a wide 170-degree viewing angle. That’s almost half a circle behind your vehicle, better than you can get with a mirror alone. You can adjust the camera angle tilt up and down with your hands once it’s installed. The camera frame is embedded with eight infrared LED bulbs so you can see clearly even on a dark night or in an area without lights. If you have a NTSC-compatible screen you wish to use inside your vehicle, you’re all set. The Esky camera connects with an RCA adapter cable to give you a resolution of 510 by 496 picels, or 420 TV lines. Do keep in mind that what you see on the screen is a mirror image, the reverse of what you would see with your eyes. The backup camera runs off your car’s 12V battery. If you’re unsure how to wire its power lines into the harness wires that run your backup taillight, please consult a mechanic. That way the camera switch is controlled by your reverse gear shift. We can see why both of these backup camera systems are popular. They can be used in all sorts of weather and even in the dark. They are bound to save you time and stress because you can park and back up more safely. If you prefer to hard-wire your rear view camera, the Esky is the option for you. Of course, you will need to invest in a screen if you don’t have one already. And you may need some assistance setting it up if you aren’t comfortable doing the wiring yourself. On the other hand, the Pearl RearVision is very easy to install mainly because it’s completely wireless. It won’t drain your car’s battery because it runs off solar power. You will need a smartphone with Bluetooth, but the Pearl app is compatible with both Android and Apple iOS. We recommend the Pearl RearVision over the Esky because it’s a simple, all-in-one solution that anyone can install and use. That’s really neat how much a backup camera could make backing up easier. I like that you can use them in the dark and even in bad weather, like you said. I just bought a new car and would love to install a backup camera.